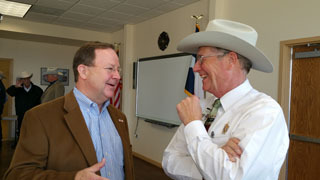 Congressman Bill Flores was elected to the U.S. House of Representatives in November 2010. He serves the 17th Congressional District of Texas, which covers portions of Central Texas from Waco to Bryan/College Station to North Austin. Congressman Flores serves on the House Energy and Commerce Committee and was chairman of the Republican Study Committee during the 114th Congress. We invite you to sign up on this page to participate in our upcoming telephone town hall meetings. Join Congressman Bill Flores for a live, telephone town hall meeting on May 1st at 6:30pm to discuss important issues facing our district and our country. Congressman Flores wants to hear from you and get your feedback. Please, sign up here to register and receive a call for Congressman Flores's next telephone townhall - you'll be able to listen in and ask questions from the comfort of your own home! Congressman Flores is looking forward to speaking with you! Join Congressman Bill Flores for a live, telephone town hall meeting on April 30th at 6:30pm to discuss important issues facing our district and our country. Congressman Flores wants to hear from you and get your feedback. Please, sign up here to register and receive a call for Congressman Flores's next telephone townhall - you'll be able to listen in and ask questions from the comfort of your own home! Congressman Flores is looking forward to speaking with you!